One of the most popular dishes on the Seder table is charoset, the fruity spread used to symbolize the sweetness of our ancestors’ freedom from slavery. In every Jewish culture there is a charoset that reflects the unique ingredients of the region. While the most traditional charoset that Ashkenazim (Germanic and other Eastern European Jews) prepare consists of finely chopped apples, walnuts, wine, cinnamon, and some sugar, most Middle Eastern and Mediterranean communities use dried dates as their base, adding other dried fruit (such as raisins and figs), along with varying spices and nuts. The charoset takes center stage on he Seder plate, and is the dish where one can be most creative. Below is my recipe for a Syrian charoset that uses dried apricots in place of the usual dates in most Middle Eastern charosets (in Syria they also do a charoset with dates sometimes mixed with the apricots). The orange color of the apricots really brightens up the Seder plate and table, and the sweet-tart flavor is especially nice if you find pure dates to be too sweet. 2. 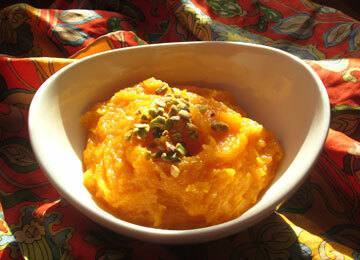 Pour hot apricot mixture into a food processor and add the lemon juice and orange blossom water. Pulse 1 to 2 minutes until a smooth paste. Scoop out into a medium sized bowl and mix in the chopped nuts by hand. Cool to room temperature.